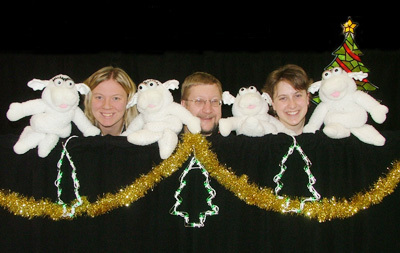 Hands 2 Grow Puppet Productions is a multi-talented troupe sharing character-building messages with the community at large. Hands 2 Grow encompasses the wide spectrum of puppetry styles and techniques including "muppet," hand puppet, marionette, rod, sock, and shadow puppets. Songs and story-telling round out the fun and learning. The roots of this performance team go back to marionette performances in the 1960s. Re-energized in the 1990's, Hands 2 Grow was reborn as a church ministry and has branched out since then to offer religious and character building performances for schools, libraries, camps, and more. H2G has performed across the Midwest and East Coast. Through the Hands 2 Grow website, the group has reached out across the world. Several of their scripts have been performed internationally. We also offer workshops and puppet-building services.